Patented gas operation that can be set for different loads. Selective single or auto loading capability. Increased action strength with a 3 lug and enclosed face rotary bolt. Ability to handle high pressure loads. Fixed barrel resulting in increased accuracy and ability to load a wider variety of bullets for the hand loader. Barrels can be interchanged to other lengths and/or calibers. 45 Winchester Magnum, 45 Wildey Magnum, 475 Wildey Magnum. 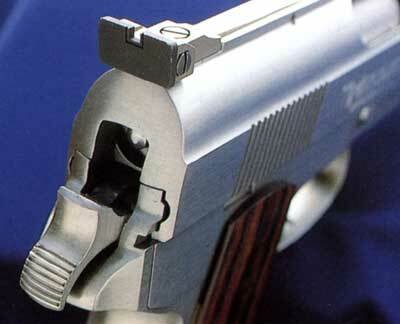 Double or single action trigger mechanism. Sights adjustable for windage and elevation (White outline optional). Weight: 64 oz. with 5" barrel. Patented hammer block, patented trigger block, rebounding firing pin. Patented grip lock, select hardwood grips. O/A length (7" bbl.) 11", O/A height 6". Sight plane (10" bbl.) 13".